friends and show them your talent. 1.) Paint the egg cups and the coffee cup with green paint. 2.) Cut the cup to about 2” from the bottom. 3.) Cut one of the pipe cleaners in half. 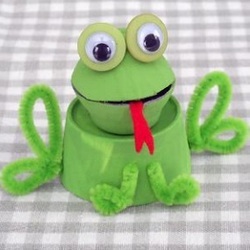 Bend the top of the pipe cleaner into a loop and twist. This forms the top of the back leg. 4.) Now bend the bottom half into a loop, forming a shape similar to a heart. Leave a little excess pipe cleaner sticking out to poke into the side of the cup. 5.) Repeat with the other half of the pipe cleaner to make the second back leg. 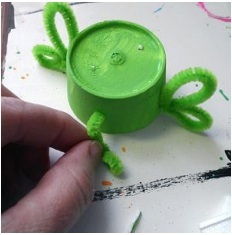 Poke the pipe cleaner leg into the side of the cup body. 6.) For the front legs, cut the second pipe cleaner in half. Set one half aside for a future project. Take the remaining half and cut that in half. 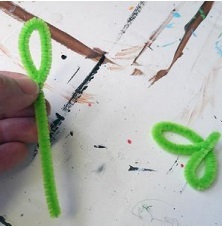 Bend one end of each pipe cleaner into a small loop for the front foot. Make a bend in the front leg and poke it into the front of the cup. Repeat for the other leg. 7.) Cut a forked tongue from red felt and glue inside one of the egg cups. 8.) Glue the egg cups together, open end to open end. 9.) Glue the egg cup head to the body. 10.) Glue googly eyes to the buttons. 11.) Glue the eyes to the head.